I love the ambiguity of this word; a backfriend can either be a backstabbing traitor in waiting or a faithful companion that will never leave you behind. You've noted, of course, that the negative meaning of backfriend is now considered obsolete, but then that's exactly what a conniving backfriend would want you to think, right? Whichever it is, the seeds of doubt have been planted: you'll never again hear the words 'I got your back, bro,' without feeling a gnawing sense of unease. Hahaha, he's got his back XD I've seen this joke around but it keeps being funny! Thank you for liking my cartoons, it means a lot to me, to receive positive feedback :) I'm glad you enjoy them so much they inspired you to draw things too! You should continue! It's a great way to take your mind off things or to put things in the right perspective. 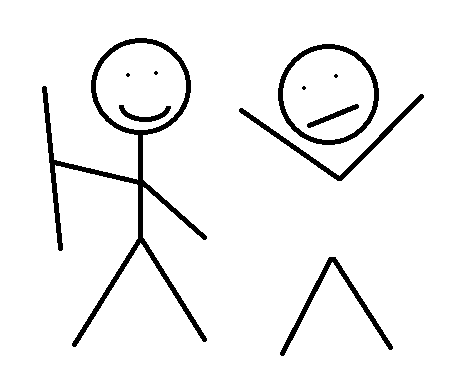 You're underestimating the power of the stick-figure! There's a guy I follow (link here), he writes kind of the same stuff as me, things that happen to him in daily life, frustrations, thoughts, and he uses stick-figures to illustrate. Granted, they're a bit more elaborate than yours, but it's just to point out that you don't have to be an artist to get a message across.